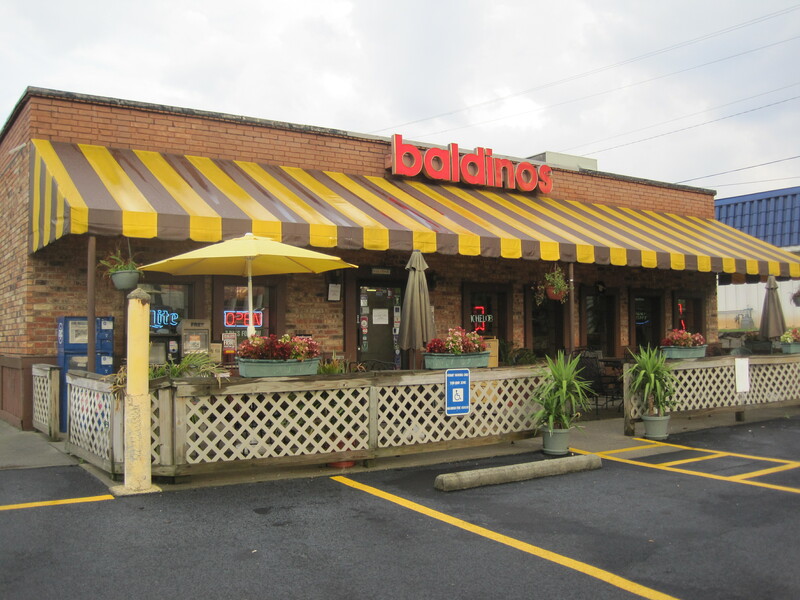 It’s one of these disappearing Atlanta places, Baldino’s is. 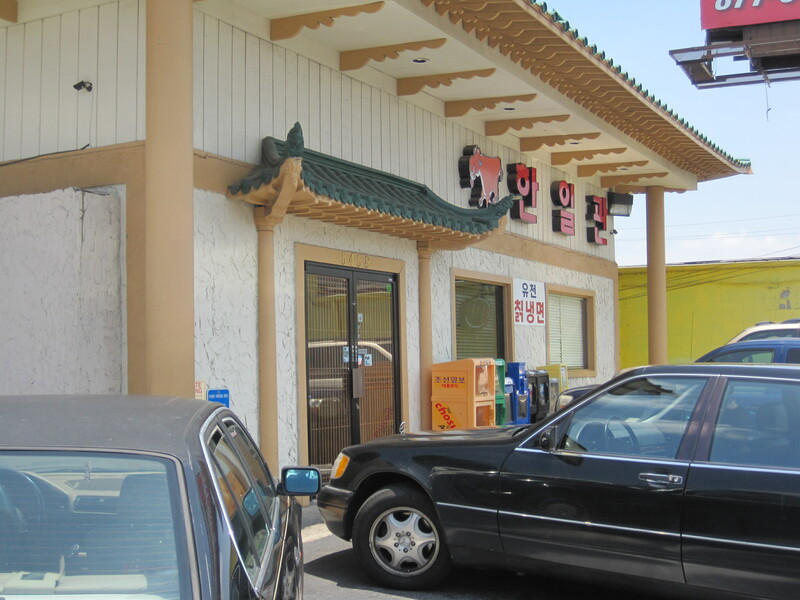 It’s roughly across the road from Buford Highway Farmer’s Market, and used to be a favorite of a 6′ 2″ Korean coworker whose build and athleticism eliminated any notion of Asians as small and spectacled; amazing that he’d find a Jersey sub place among a center of Korean eating. It’s pretty ordinary from the outside. Inside, there are a host of records, album covers, trophies, and memorabilia of all kinds. That someone put Smokey Robinson on the wall spoke of someone knowing something of the past. 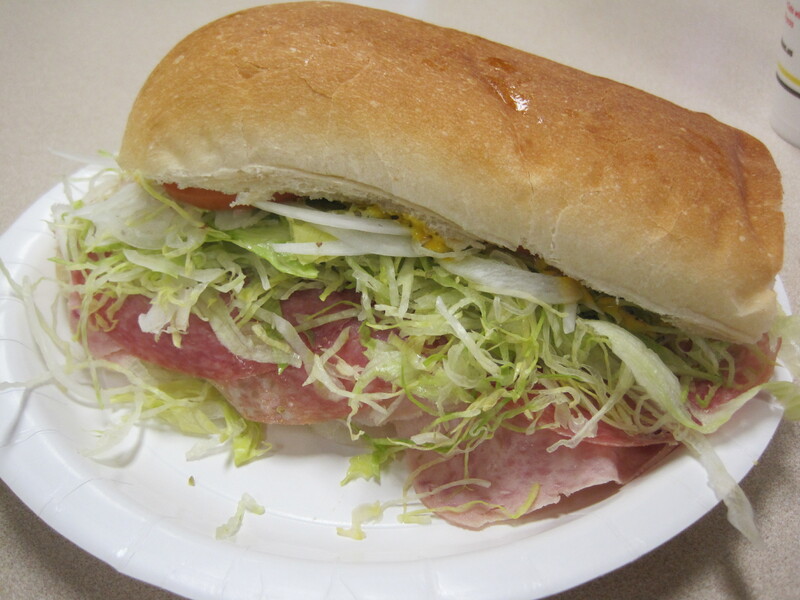 What’s not so ancient and forgotten are Baldino’s subs, which come in more ethnic, heavier cuts of meat and cheese than the typical sub place. They’re also bigger. This photo is of a half sized Baldino’s special. Biting into the sandwich, I end up with nearly a half inch of meaty layers in the middle, a bit of cheese to add fat and flavor, and just enough mustard to please. The bread is hard to ignore, even on my diet. I like this place, have been surprised that no one has ever bothered to write about it. Like so many good eateries just not cool enough for the cutting edge, it gets ignored by the foodie generation. This is one place that shouldn’t be. Verdict: Excellent, inexpensive subs. Highly recommended. 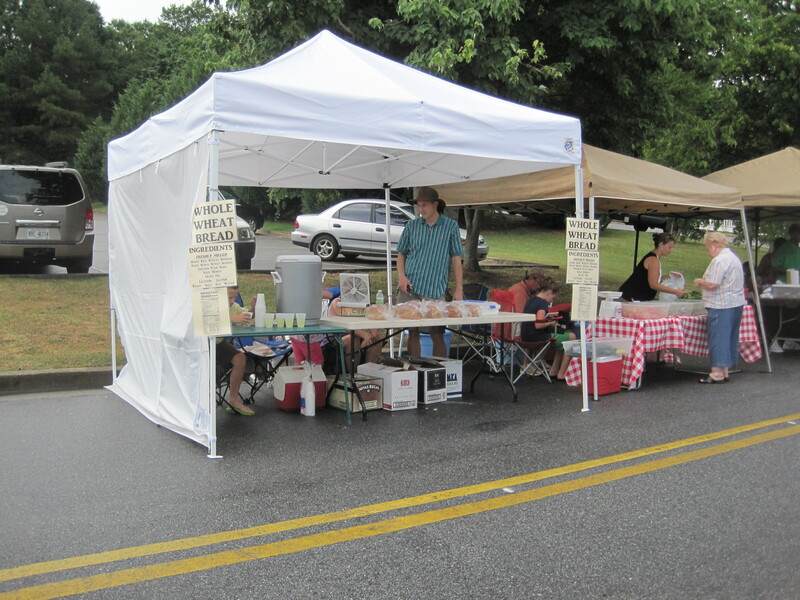 Held on the same block as City Hall, and living on a cordoned off street on Friday afternoons, the Lilburn Farmer’s Market wasn’t one I had been to before.I managed to sneak into the market on a day when there were spotty thunder showers, lots of lightning, and quite a few umbrellas packed in preparation. 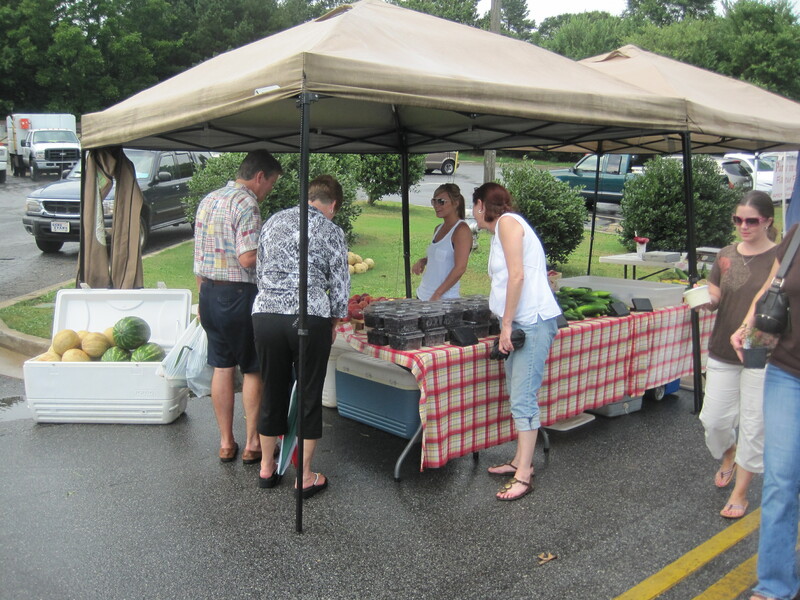 That didn’t eliminate the smiles and friendly people, however, nor did the fresh breads, cakes, and produce run away. Cheese Wars: how do the Pastureland cheeses hold up? Cheeses are an indulgence I can deal in without issues, but the pressures of a diet and trying to remain healthy also factor into buying decisions. Is it worth it to get the butter from grass fed cows, or just buy the cheap stuff at Wall-Mart? What about eggs? Free range grass fed or feedlot eggs? Is it worth it, on a taste basis, to buy healthy cheeses? These are questions I ask myself almost every day. To help answer these questions in part I did a taste test of 5 cheeses, including 2 new arrivals from Pastureland, and kept notes. 1. Black Diamond Grand Reserve. I eat so much of this I think I know what to expect. It’s a flavor I’d call cheesy and cheddary, and it’s almost immediate. Unlike some sharp cheddars, there is no bitterness and no overpowering flavor. Instead the flavor just grows on you and then seems to linger forever. The rich, deep cheesy sensations are what separates this cheese from wanna bes. 2. Boar’s Head Canadian Cheddar (Old World Collection). I tried this just to see if I wasn’t kidding myself in my Black Diamond addiction. My notes include: up front flavor less than that of B(lack) D(iamond), and more of a sharp salty aftertaste. Flavors include overtones of creaminess, butteriness. Lingering tastes. Good eating cheese. 3. Pastureland Organic Cheddar. Notes: more subdued, smoother, milky, creamy, a hint of some bitter flavors. Tastes do linger. Lingering flavors less concentrated and intense than the first two cheeses. 4. Pastureland Sogn Artisan Alpine Style Cheese. This was a bit of a misfit in the comparison process, being more aptly compared to a Swiss. Notes: initial tastes include aromatic overtones. Aftertaste very mild, buttery, milky, salty. Coffee flavors would work well with this cheese. 5. Kerry Gold Ivernia. Another mismatch, as this cheese resembles more a Parmesan than a cheddar. Notes: immediate and upfront. Nutty. Rich lingering aftertastes of salty cream, nuts, fruits. In terms of delivering sheer flavor, Ivernia was at the head of the pack, followed by Black Diamond and the Boar’s Head cheddars, then the Aged Pastureland Cheddar and then the Sogn. 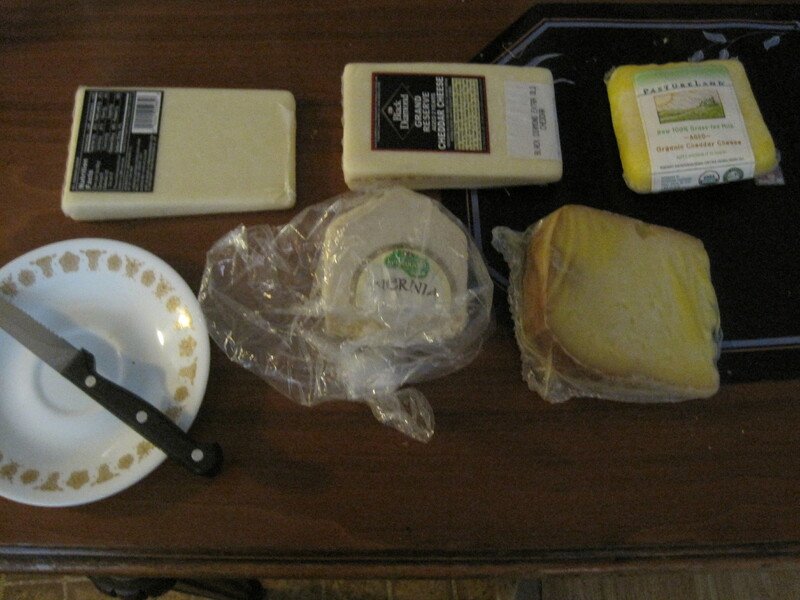 But given the approximate variety of these cheeses and how long they were aged, that was the expected result. In conclusion? If you don’t expect flavor miracles from the Pastureland Cheeses, they’re just fine. Issues I had with them on receipt were that the cooling ice had melted and they weren’t in the best of condition on arrival. If you want picture perfect cheeses, it would be best to have them shipped 2nd day air. 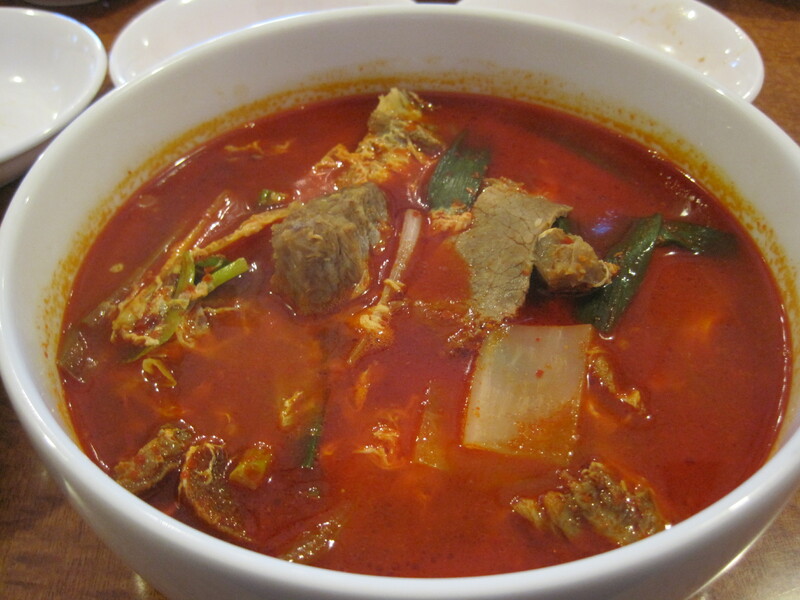 It was a picture of a bowl of soup that led me to Han Il Kwan. 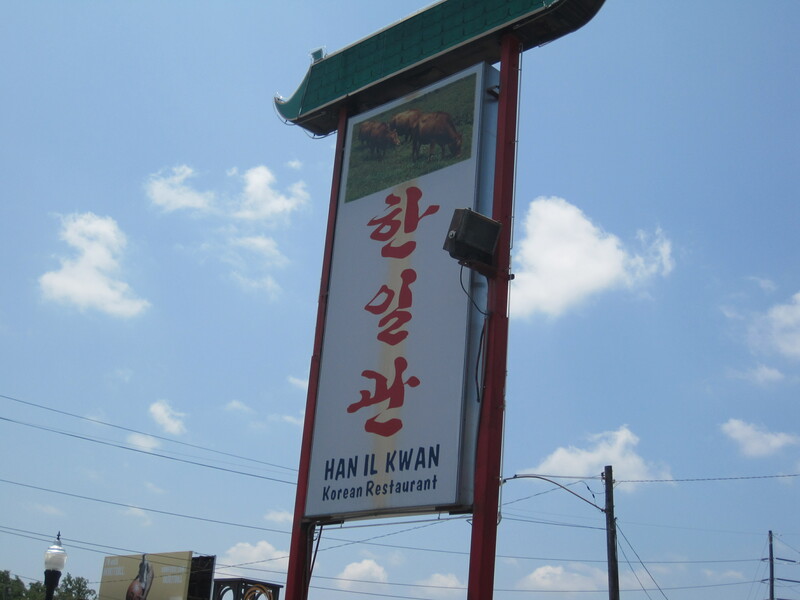 More specifically, it was the picture by Sean on Take Thou Food that led me to Han Il Kwan. It looked good, and Korean soups are easy on my diet. So when I had time around noon one day, I picked up my daughter and we headed down to Buford Highway and to this restaurant. It’s roomy and bright, and they use a lot of natural wood, in framing, tables, doors. I like that look, and in general like the appearance of Han Il Kwan inside. Since we were at lunch, we got a lunch menu. They had bento boxes of various kinds, and then a variety of soups. There was soon dubu, and Sean’s yuk gae jang (which I think I had at Royal Tofu house), and there were some others. I wanted something spicy, so I tried the mae woon galbi tang. Regular galbi tang isn’t spicy. 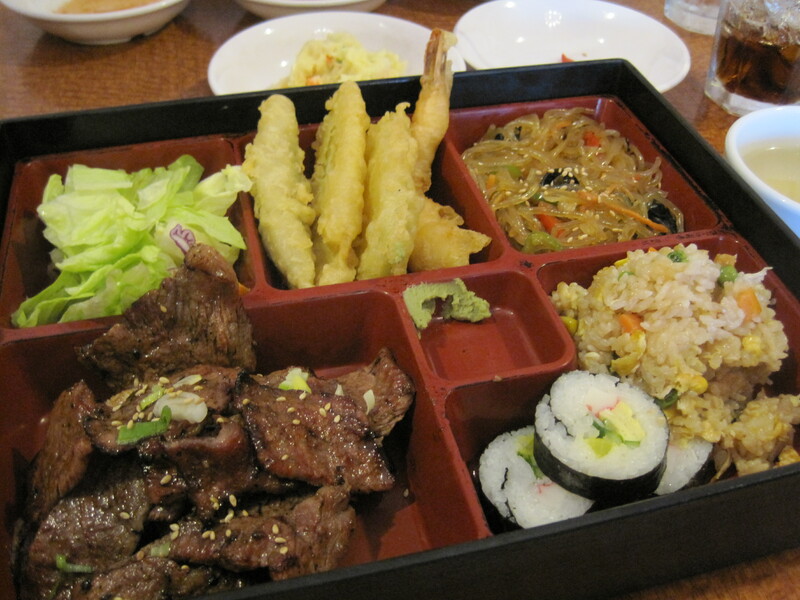 My daughter had the galbi bento box. The funny thing about the box is that the only identifiably Korean item in the box was the galbi itself. Neither the tempura nor the sushi were ethnically Korean. Fried rice is as much Chinese as anything else. The noodles? Perhaps the noodles are Korean, but noodles are everywhere in Asia. Still, my daughter liked her food. I really enjoyed the soup. Meats, rich with fats and cartilage I usually don’t get on my diet were combined with vegetables, pepper oils, scallions and some transparent noodles into a simple earthy bliss. I would have happily eaten a second bowl of the stuff but for the diet I am on. 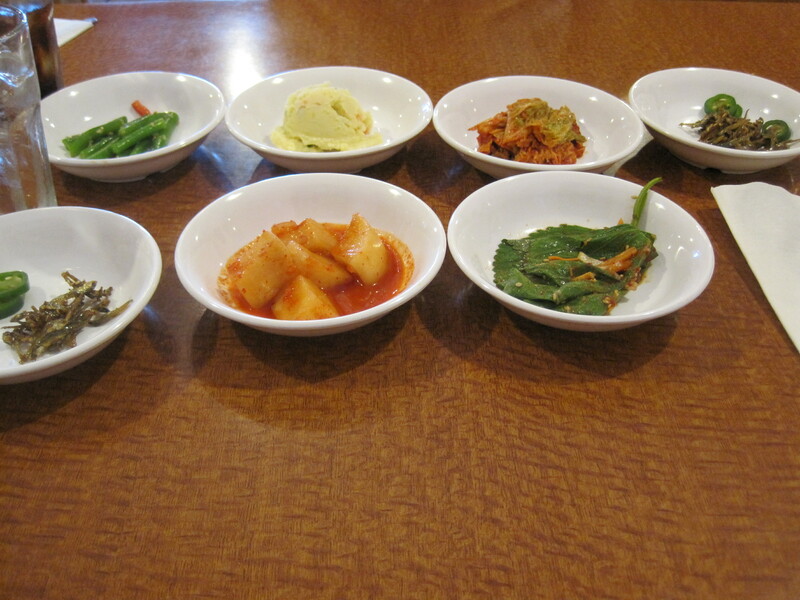 Instead we emptied bowls of banchan while enjoying our entrées, and had our waitress coming back and forth for a while. Verdict: Good looking, roomy, and to my palate, good food. Highly recommended. I found Papi’s on a day when I couldn’t choose a place to eat. I ended up on Duluth Highway, heading south towards Lawrenceville. At roughly the intersection of 316 and Duluth Highway, I caught Papi’s out of the corner of my eye and turned. 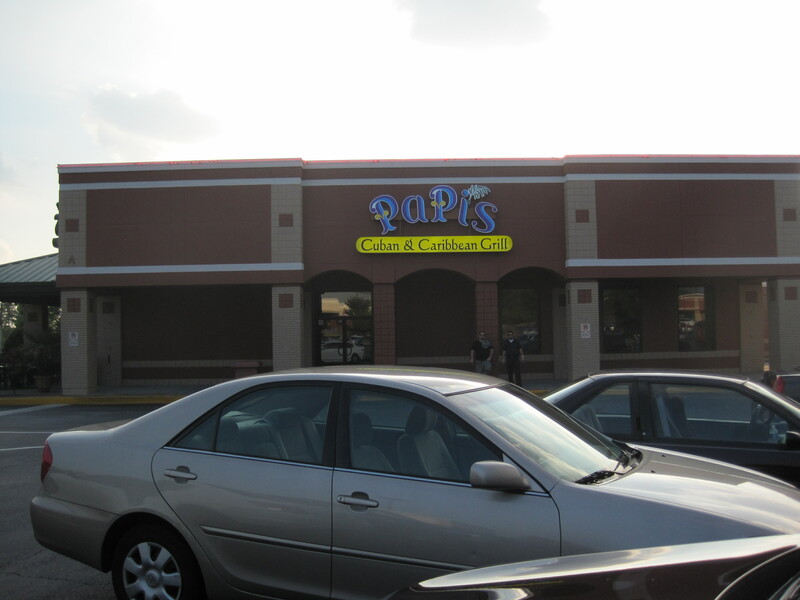 At the time I thought Papi’s was a “one of”. 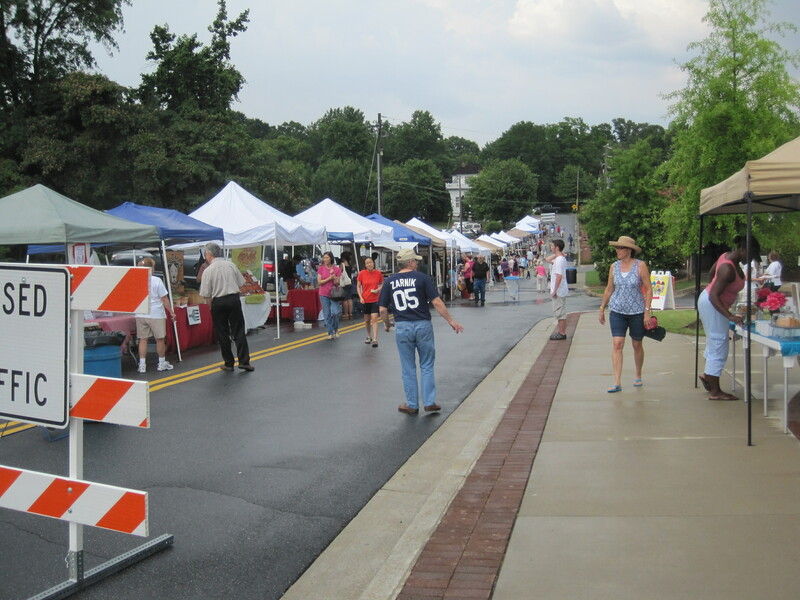 Only later did I find out it’s the fourth edition of a small Atlanta chain, and very well respected. At the time, though, I was just hungry and curious. 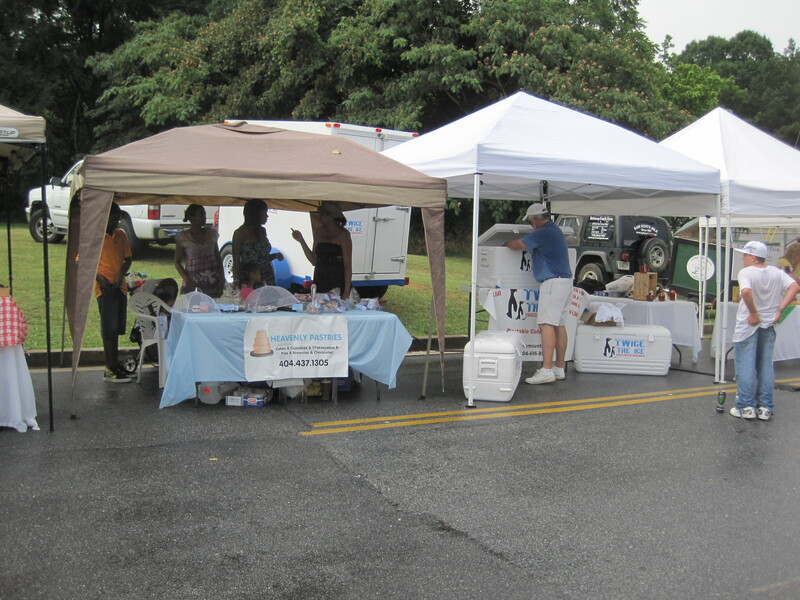 I’d had conversations with men wanting to set up Cuban restaurants in the Lawrenceville area. Was this one of those, a new start up? 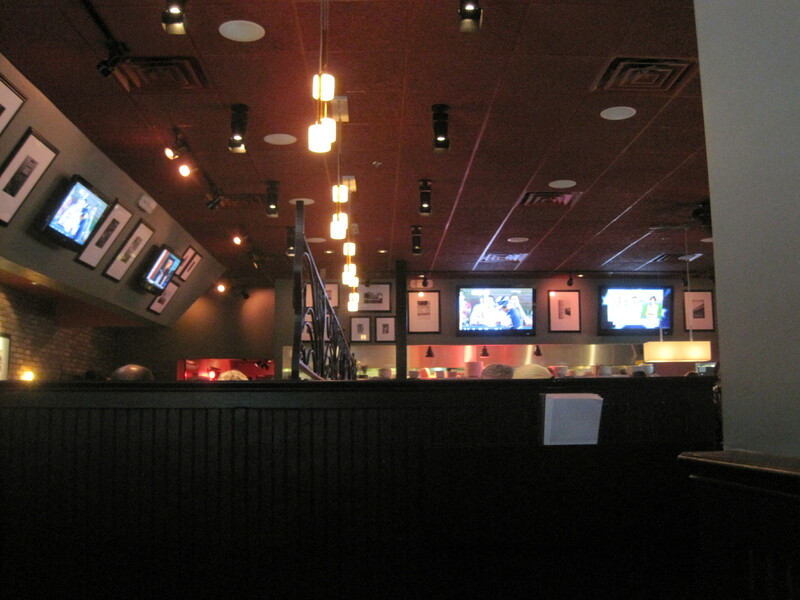 Inside, there were chairs and booths mostly circling around a bar in the middle. There was outside seating, but the day was too warm to really want to sit outside. The crowd ranged from ordinary families to beautiful couples dressed to the max. Staff was around; my waitress was good and dropped by my table often. Seating was soft and woven, as opposed to wooden, and the green plastic palm tree leaf place mats on the tables kind of cute. Though there is Caribbean in the name, there is precious little Caribbean food here. It’s essentially a Cuban eatery, with the option of getting jerk wings and a jerk chicken sandwich. No peas and rice, no patés, none of the accoutrements of a serious Caribbean place. It does have a nice selection of Cuban foods. While looking over the menu, I ordered a salad and also a Cuban sandwich. The salad was decent, not overwhelming. 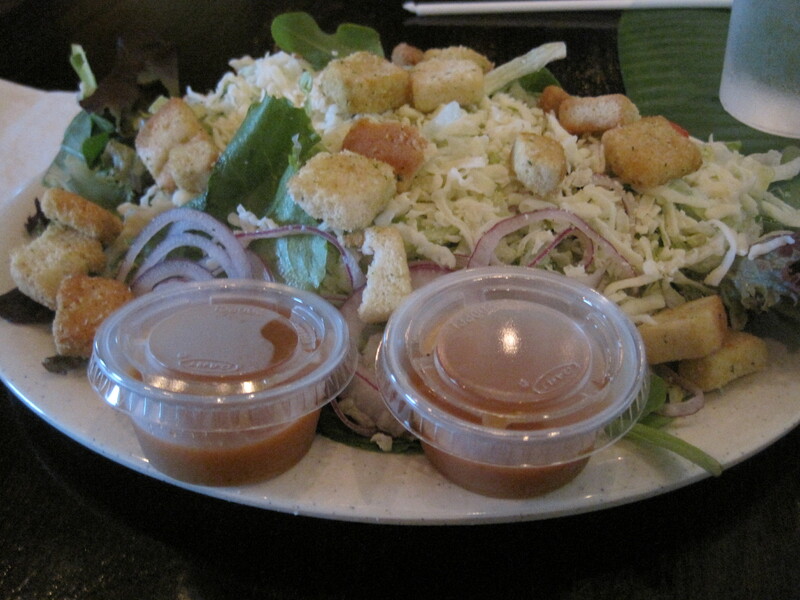 The mango vinaigrette wasn’t bad, but I’d much have preferred a balsamic. I don’t need stray sugar in my foods, and the mango product was a little sweet. 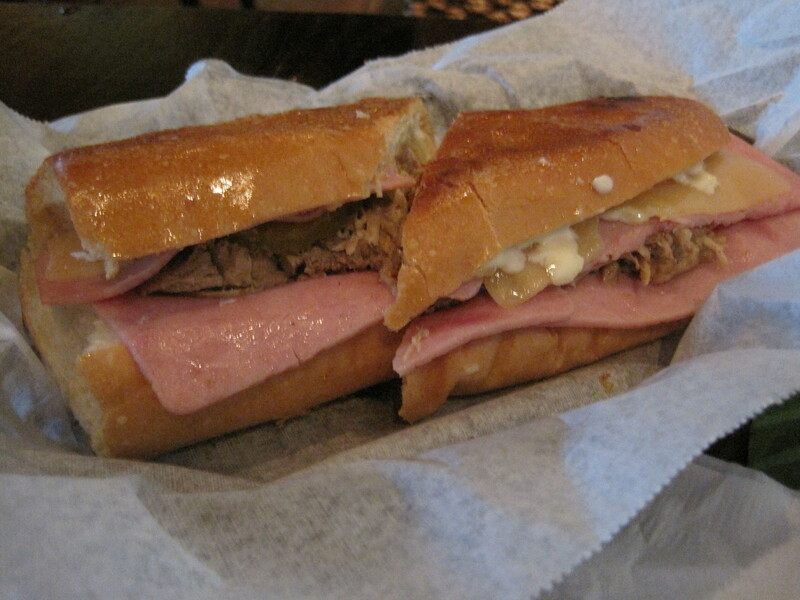 The Cuban, as well, was good, and the shredded pork, ham slices, and melted cheese quite welcome. But the bread looked like a regular po’ boy loaf, and not the flatter grilled breads I’m accustomed to seeing with a Cuban sandwich. The taste was just a little different as well. As I had Cubans regularly when I lived in Orlando FL, it left me wondering what accommodations had been made in the sandwich so far “north”. I’ll note that other reviewers (examples here and here) of other locations have much the same reaction, that the food is good and worth some trouble, but not really exceptional. As there is simply nothing like it in this part of Lawrenceville, I’m sure Papi’s will do well. 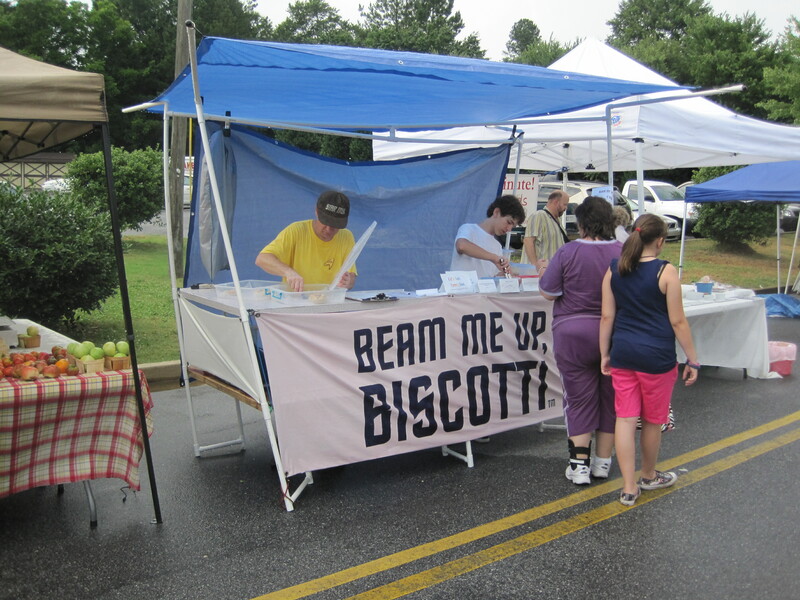 Relatives are arriving, so though I have material for reviews and some nice new pics of the “Grand Opening” of the Snellville Farmer’s Market, I don’t have time to post them yet. My wife has us all working hard in preparation. Many apologies, and once the relatives are here, the madness may calm enough for me to post a photo or review or two. I will say this. Relatives arrive around 6pm at Hartsfield. We can get them home and put up things by perhaps 7:30pm. Most places will be packed with Father’s Day eaters. So what’s a good place to eat circa 8pm (or even 9) on a day like this? I’ll be happy to check out any suggestions. Tomatoes have been producing well (surprising how they can do that potted but not in the soil of my yard), the Japanese eggplant is fruiting, and for the first time, my sole boonie pepper is flowering. 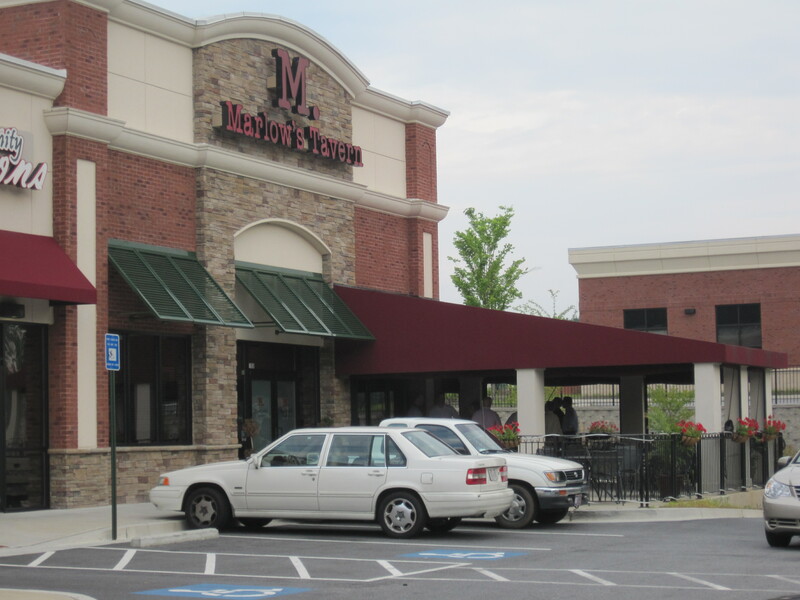 Marlow’s Tavern is a small Atlanta area chain, with 6 restaurants in the nearby area. There is one in Duluth, just off the Sugarloaf Parkway exit at I-85 and a little north of the junction between Satellite Boulevard and Sugarloaf. It’s on the right as you head north on Satellite Boulevard, up on a hill. There was a bit of a party outside when I got there, a group of about ten to twelve that knew one another. The building, both inside and outside, is elegant and sophisticated. Once inside, seating was nice, the menus were styled in a more long than wide fashion. But it’s still a bar, even if they have a wine menu, and the wine racks are easily visible from table seating. 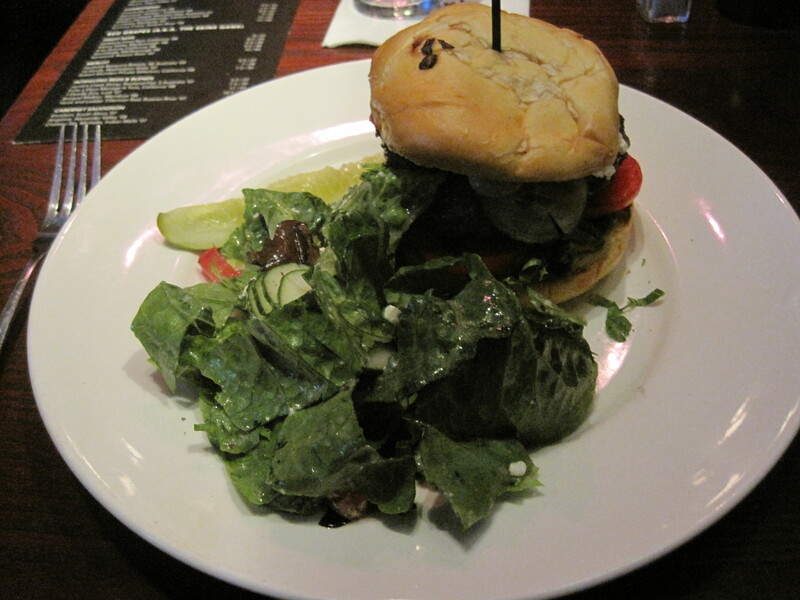 Marlow’s has an online menu, and I had tagged the lamb burger before I even arrived. After talking with my waiter, I got the fries swapped for some salad and sat and waited. Two businessmen sat next to me, talking about their business trips to China and Thailand. Seating is so close you will be sharing in the conversations of your neighbors. The burger was thick and juicy. The lamb tasted like lamb, as opposed to generic mystery meat, and was a medium rare burger, as I requested. The greens were fresh. Service was excellent, tag teamed, and fairly constant. The burger was a little pricey, but not that much more expensive than a nicer selection at Ted’s Montana Grill. What you get for your extra couple bucks is a graceful place to sit, some televisions and that constant, excellent service. A little more inventive and tastier than other bar/grill, taverns. So if you think you’re getting trapped in a place that doesn’t serve entrées, please think again. I’m on a diet and I ate to that diet this day. If you want a salmon steak, they’re more than capable of delivering. Verdict: Pretty place for an after work meal. Excellent burgers, excellent service. Highly Recommended.